As I spent most of the day yesterday watching the tweets, live streams, and news reports role in I found myself in shock over what I saw going on in my own country. It’s hard to come up with any response that seems fitting when confronted with such hate and violence. 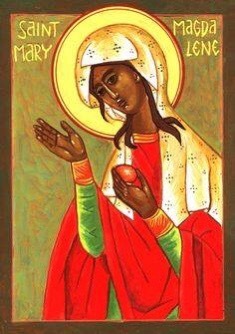 For some reason I couldn’t stop going back to Mary Magdalene. Mary has been called the “patron saint of just showing up.” I wondered if Mary were here today what would she have to say? What could she teach us in the face of such atrocities? Mary was said to have had seven demons cast from her. After being freed from demons I believe she would have showed up yesterday to name the demons for exactly what they were. The demon of hatred, the demon of Racism, the demon of violence. Mary would not have been afraid to call out these evils for exactly what they were. Mary wouldn’t have shied away and neither should we. This seems like a nice idea on a Sunday morning, but impossible on a Saturday night where a girl is dead and many more are injured just because they had the audacity to peacefully proclaim that hate had no place in Virginia or anywhere else. It seems impossible that when confronted with hate proudly marching through the streets that I’m seriously supposed to feel anything that even remotely resembles love. Jesus surely wasn’t talking about these people was he? Where’s the escape clause so I can feel justified that these people are the exception? Sadly, Jesus doesn’t give us that easy option. Instead, Jesus doubles down on this message. Just as this start to seem like too much. I’m reminded of the words of Martin Luther King Jr.
We must love. Even when it seems impossible, we must love. Even when it feels like we have to fake it, we must love. Not because it’s the right thing to do, not because it’s even the Christian thing to do, but because love is the only thing powerful enough to overcome their hate. Love is the only thing powerful enough to free us from our own demons while simultaneously freeing the haters from theirs. So hatred be damned we will love you anyway.